The index declined to add China's A shares to its widely-followed MSCI Emerging Markets Index. 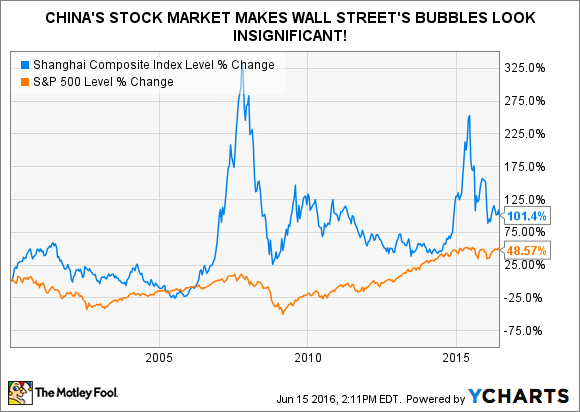 In light of China's propensity to stock market bubbles, that looks like a prudent decision. U.S. stocks are little changed on Wednesday, with the S&P 500 (SNPINDEX:^GSPC) and the Dow Jones Industrial Average (DJINDICES:^DJI) (DJINDICES: $INDU) both up 0.32% at 3 p.m. EDT. There is no interest rate hike, but traders are reading the tea leaves contained in the Federal Reserve's statement on the economy and monetary policy -- the product of this week's Federal Open Market Committee's meeting (bonus: This meeting includes a press conference, which started at 2:30 p.m.). Proper investors will know to ignore all of this, as it has little to no bearing on long-term business values. Keep up the good work, China -- you're almost there! That was the message from index provider MSCI Inc, which announced yesterday that it is once more deferring the decision to add China's domestically traded A shares to its benchmark MSCI Emerging Markets Index until June 2017 (or potentially earlier -- an "off-cycle" announcement is possible). At the end of May, China already represented 24% of the index, with five Chinese companies among the top 10 constituents: Tencent Holdings Ltd, China Mobile Ltd., China Construction Bank Corporation, Alibaba Group Holding Ltd, Industrial, and Commercial Bank of China Ltd. These names are listed in Hong Kong, except Alibaba, which floated on the New York Stock Exchange in 2014. The largest, most prominent Chinese companies are listed outside of mainland China. After having polled institutional investors, MSCI cited a number of technical shortcomings Chinese authorities need to address in order to bring their financial markets up to snuff and merit inclusion. But there is one characteristic MSCI didn't mention -- something regulators may have a tough time dealing with: China's stock market appears to be highly prone to bubbles. As you may recall (somewhat painfully, perhaps), the S&P 500 has had its share of ups and downs during this period, but by comparison with the volatility of its Chinese equivalent, that looks like a quiet Sunday afternoon stroll. Two huge bubbles (and subsequent meltdowns) in the space of less than a decade is an impressive feat, even by the standards of "sophisticated" markets. A full inclusion of Chinese equities would turn the emerging markets index into a Chinese vehicle: In May 2015, MSCI estimated it would raise China's weighting from 25.3% to 43.6% (admittedly, China's equity market capitalization was higher at the time). Thankfully, MSCI will take a progressive approach to adding A shares, likely starting with a partial inclusion of just 5%. Given the volatility this market has exhibited over the past decade, "easy does it" looks like a wise approach. [Born into extraordinary wealth, privilege and opportunity, Caspersen is accused of engineering a Ponzi scheme that sought to defraud investors -- including members of his immediate family -- of $150 million. The scheme was meant to cover losses Caspersen had incurred on repeated one-week option bets on the S&P 500. According to his lawyer, Caspersen blew through $20 million of his own wealth over the course of the past decade and is now essentially penniless. Hat-tip to The New York Times for its coverage (login required)].